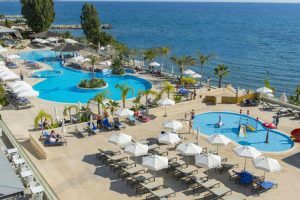 The Royal Apollonia Beach Hotel is a 5 star newly renovated hotel, situated in the heart of Limassol, on a sandy beach, surrounded by extensive gardens and framed against the glittering Mediterranean Sea. The Hotel is 50 minutes away from Larnaca International Airport,10 minutes from the town centre and a few minutes away from shops, bars, restaurants, nightclubs and places of archaeological interest. The Royal Apollonia features 204 completely refurbished bedrooms including 13 suites of varying sizes. 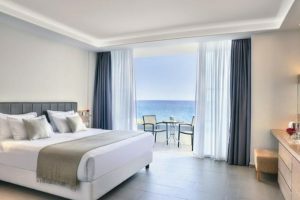 All rooms at the Royal Apollonia Beach hotel have modern furnishings and large floor-to-ceiling windows. They are decorated in bright colors and have air-conditioning/ heating, private balcony, direct telephone, WiFi internet access, mini-bar, tea & coffee making facilities, satellite TV, etc. Dionyssos Restaurant, is the main hotel’s restaurant, serving breakfast and dinner daily, including traditional local dishes. Akakiko Japanese, is a renowned a la carte Japanese restaurant, serving lunch and dinner. 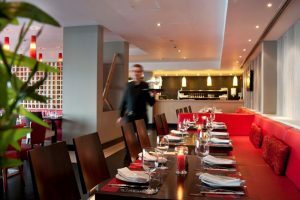 Cos’altro Italian, is an authentic Italian restaurant open for dinner serving pasta, pizza, risotto, salads and a broad selection of other main courses. Thalassaki Tavern is an outdoor restaurant with spacious terrace, serving an extensive buffer and a la carte menu. Aphrodite Lounge & Terrace is open from the early hours serving coffee till the very late hours serving exotic cocktails, rare whiskies and coffee. Ocean Blue Bar, is an open bar -half of the bar is actually within the swimming pool- serving drinks and snacks. The Hotel provides two tennis courts; an outdoor swimming pool, gym, outdoor Jacuzzi and spa. The hotel also features a squash court, a leisure club, a games room, varied Entertainment / Animation program, Jacuzzi and an indoor swimming pool.